DETS has begun using Zoom Desktop Conferencing service for its synchronous online course collaboration this semester. This service allows professors and students to effectively collaborate live via the Internet. Although the majority of online courses are designed to be used asynchronously, the addition of a synchronous discussion section adds a “real time” on-campus element to the course. Zoom is a cloud based service that is more cost effective than maintaining the hardware in-house. This increases reliability and ensures that the end user is provided with the best live, interactive experience possible. Flexible layout which allows all participants to be seen simultaneously. Real time chat so discussion points can be commented on even if you are not the current speaker. Data rate matching so that participants with a variety of Internet connection speeds can still all participate. The ability to share your computer desktop, or application with annotation capabilities. Connect to room based systems which use codecs (Polycom, Cisco, etc.). 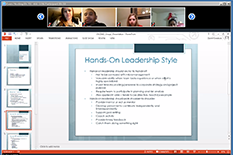 The first program to use Zoom was The Project Management Center for Excellence. Its world renowned asynchronous online program, began in 2006 and now serves over 133 local, national, and international students each semester. One major component that differentiates this online program from others is the use of a synchronous discussion section for each class. With the adoption of the Zoom service, professors and students can more easily participate and collaborate regardless of location or time zone. According to Mr. John Cable, Director, of the Project Management Center for Excellence, switching to the Zoom platform has been very well received by his faculty. “They love it” Mr. Cable states, “It is easier to use, has far fewer hiccups, is intuitive, and is technically superior for audio and video. I highly recommend Zoom”.